Fall is finally here! To make the most of the season, here is a list of 40 fun family-friendly activities you can enjoy together this fall. 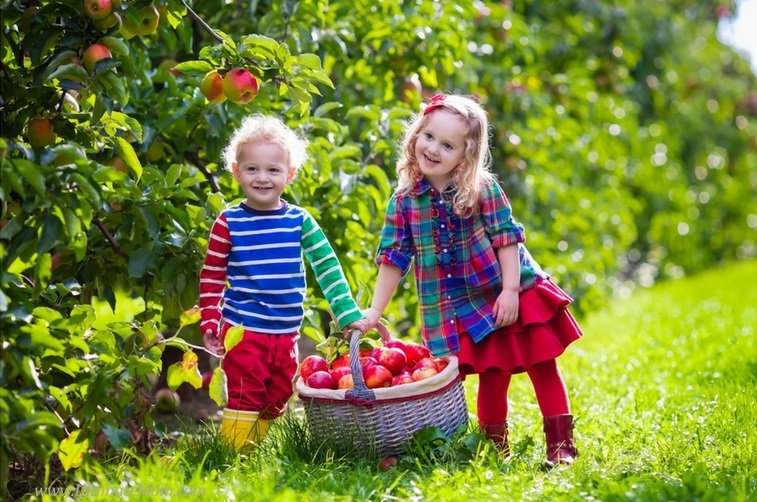 Apple picking is a really fun way to get outdoors with your family. The best past is most places charge by the weight of the apples you’ve picked, so it’s a really inexpensive family outing. Plus, it’s a great way to stock up on apples because orchards usually have varieties of apples grocery stores don’t carry. What better way to use your freshly picked apples than to make candied apples. There are some really clever recipes for candied apples such as this clever recipe for making any color of candied apple you can imagine or this great list from Woman’s Day that has 11 different gourmet candied apples recipes. You can also invite your friends and family over for a candy apple bar. You can use the rest of your collected apples to bake a classic apple pie. We love this recipe for apple hand pies your kids can easily help you bake. In the fall, many local farms offer tours for families. You kids can see how crops are planted and harvested, meet livestock, and taste some delicious fall produce. To find a farm that offers tours you can search your local community directory or ask around at your local farmer’s market. Fall is harvest time, so the farmer’s markets are loaded with great fall produce. Go with your kids to grab some favorites and maybe pick out something new to try together like an unusual winter squash or salsify. Grab a to-go mug of hot apple cider and pick out some of your family’s favorite tunes and take a fall Foliage drive to look at all the beautiful colors. You can even do a scavenger hunt during the drive to keep your children entertained. Here’s a great site with a bunch of different fall-themed scavenger hunt printables. Take a hike through a local forest to collect leaves, twigs, acorns, and pinecones. You take what you collected home for some great fall crafts for kids. After your nature walk, you and your kids can sit down for some fun craft time. There’s tons of great crafts you can make with collected leaves. Here’s a fun list of 36 different fall leaf project that a crafty mommy blogger put together. When you are on your nature hike, make sure you and your kids also collect some pinecones. Pinecones can be used to make a variety of great crafts or just painted some bold colors to display on your mantle or in your fall centerpiece. There’s all kinds of fun fall fairs from carnivals to harvest festivals. Check your local newspaper for the upcoming fall fairs in your community. Most people think to visit their botanical gardens in the spring and summer. However, most local botanical gardens have beautiful wonderful fall exhibits of hardy kale, mums, and tours of fall foliage. Fall is the time to plant any bulbs for spring flowers like daffodils, tulips, and crocuses. Pick out some beautiful flowers with your kids and getting digging so you can have a beautiful early spring garden next year. While you are out in the yard, don’t forget to rake a big pile of leaves to jump into. As a bonus, when your family’s done, they’ll be in one big pile for easy bagging. Keep your bird friends fed through the winter by making a bird feeder. You can make classic pinecone bird feeders with peanut butter and birdseed or you can make one of these crafty bird feeder DIYs. Hayrack rides are a classic fall activity. Just make sure you pack some blankets because they can get pretty chilly. A corn maze is a fun adventure you will have to work together as a family to solve. So it’s a great way to bond with having fun! What better way to pick out your Halloween pumpkin than at a local pumpkin patch. Plus, many local pumpkin patches have games, rides, and other fun family activities to do so you can make a whole day of it. Once you’ve picked out the best pumpkin at the pumpkin patch, you should take it home and carve it. If you children are too young to carve a pumpkin you can decorate the pumpkin with paints and googly eyes. When you clean out your pumpkin for carving, don’t forget to roast the pumpkin seeds. Top with a little salt and olive oil and roast for 20 minutes at 300°F (150°C) for classic roasted pumpkin seeds or get creative with your spice cabinet and make some really unusual like these spiced honey roasted pumpkins seeds or these ranch flavored pumpkin seeds. Haunted house are usually for older kids who understand the fun of being scared. There are some haunted houses that are made for smaller children that feature funny cartoon versions of monsters, mazes, and funhouse mirrors. So do a little research to see if you can find one in your local area. Spooky graveyards can be a fun place to tour around Halloween. If you want to add an educational experience you can go to one of the graveyards listed on the on National Registry of Historic Places or one of the historic sites found across Canada. Light a campfire in your own backyard or at a campsite and sit around telling scary stories. You can add to the fun by roasting hot dogs and making s’mores. Have a movie night and watch a scary movie. If your kids are too young for a scary movie you can watch a Halloween-themed classic cartoon or even a campy horror film that is so unrealistic it’s more funny than scary. There are tons of fun ways to decorate for Halloween. Once you get your jack-o-lantern carved you can make these spooky spider webs out of trash bags, this bone-chilling skeleton hands wreath, or some creepy mummy hands. Also think about some fun things trick-or-treaters will enjoy like turning your front yard into a graveyard or adding some spooky sound effects. There are tons of great DIY Halloween costume ideas that you can get started on before the holiday hits. You can make some family themed costumes or having everyone figure out what they want to be and get to crafting! Even if it isn’t part of your costume, you and your kids can have a blast trying face painting. For added fun, let your kids paint your face too. You can pick up a face painting kit for cheap and find tons of great ideas. 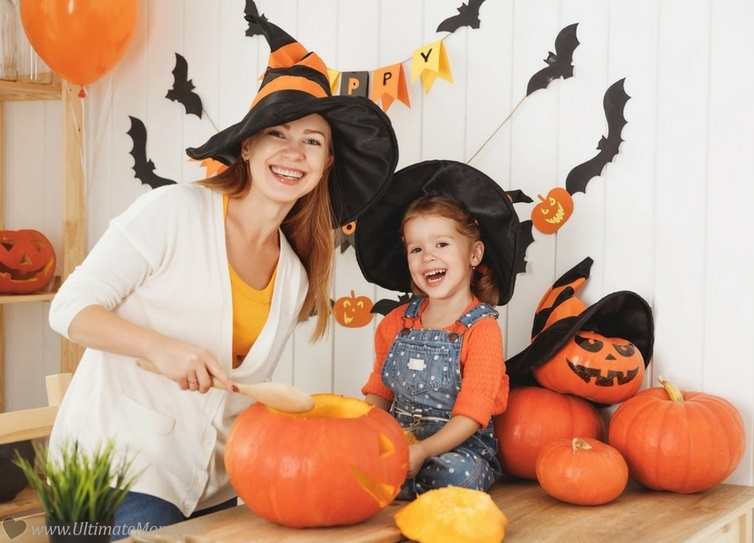 This fall activity is perfect for kids who love playing dress-up. The extra apples you snagged at the orchard can be used for bobbing for apples. Simply find a big tub, fill with water and have fun at this challenging game. You can even set it up to entertain trick-or-treaters if you want! Popcorn balls are a classic Halloween treat and are super easy to make. Mix together popcorn and melted marshmallows and let your kids have sticky fun forming the popcorn into shapes. Add some candy corn or M&Ms for an extra fun treat. A scarecrow makes a fun additional to your outdoor fall decorations and is a clever way to use old clothes. Put your scarecrow out by your garden to keep away birds or sit him on the porch to greet your guests. Here are some instructions on how to build a basic scarecrow. Once Halloween is done, it’s time to start decorating for Thanksgiving. There are so many fun decorations you and your children can craft together such as these glitter leaves, these fall leaf mason jars, or a classic turkey handprint to hang on your wall. We love this one that uses your child’s foot for the body and their hands for the tail feathers. The holiday season is all about giving. A fun and wonderful activity is to help your children collect food for the local food bank. You can help them set up a food drive at their school, your work, or just around your neighborhood. Talk to your local food bank and see what they need and get your kids out there to learn that charity can be fun! It’s football season, so what better way to enjoy fall than playing a game of touch football. You can either play as a family or recruit some friends to toss around the old pigskin. You can also set up a backyard tailgate before your “big game”. Greet your visitors with a fall wreath! Wreaths are an easy craft for children to make because there are plenty of designs that don’t require sharp tools or hot glue guns. This fall wreath uses found leaves, this adorable one is made with tissue paper glued to paper plates, and this simple wreath craft is made with apple prints. Cornucopias are a classic Thanksgiving decoration that signifies abundance. You can buy a cornucopia basket or make one yourself with these instructions. Then have your little ones pick out their favorites fruits, vegetables, and found nature items to display. Hand dipped candles are a traditional pilgrim craft. You can look to find a place where you can make your own hand-dipped candles or DIY them in your own backyard. Just make sure to supervise your children because the wax can get pretty hot. Pioneer Villages are a really fun and education experience. Pioneer Villages are set up just like the villages of our pioneer ancestors. Actors offer demonstrations of traditional pioneer crafts and recipes. Some pioneer villages even let children get on the fun. Pioneer Villages are great in the fall because they help teach children about how the pilgrims from the time of the first Thanksgiving lived. Fall is baking season. The warm oven filling the house with cozy scents while the weather blusters outside. What is more Autumnal than pumpkin bread? Here’s an easy recipe for a super moist classic pumpkin bread you can make together. If you want to get experimental you can also try this chocolate chip pumpkin bread or this cream cheese-filled pumpkin bread. A Turkey Race is a group marathon done the morning of Thanksgiving so it gives people the chance to burn off some calories before stuffing their bellies. Turkey races are great for the whole family because they support physical fitness and usually come in a variety of lengths so everyone can participate. So check your local activity listing to see find a turkey race in your area. Another fall family craft teaches an important life skill. Scarves are the easiest thing to knit and so even your beginner kiddo can make one. There are thousands of free scarf patterns online or you can buy your kids a scarf making kit to get them started.